You will see berries from time to time on the trail. 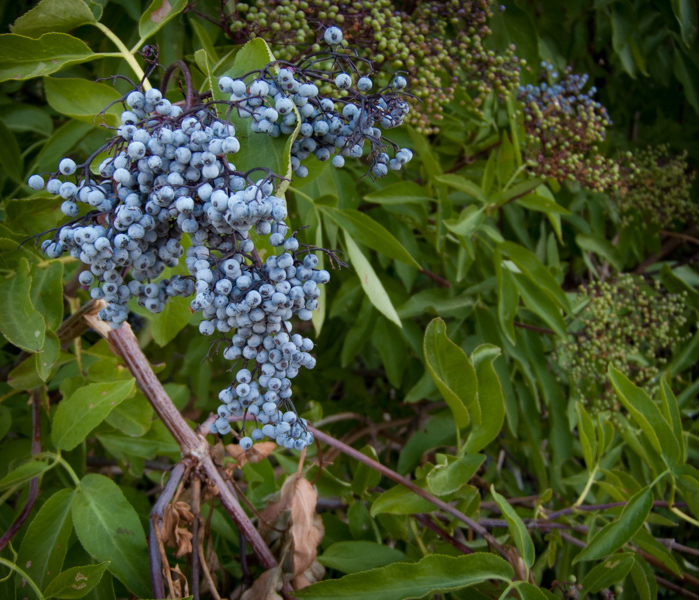 Below 10,000 feet that includes the blue-white elderberries (sambucus cerulea). The fruit of the elderberry shrub (it is considered a shrub, despite the fact that it can grow as high as 30 feet) is quite common. The white tint comes from the glaucous covering. Glaucous, botanically speaking, means that the berries are covered with a grayish, bluish, or whitish waxy coating or bloom that is easily rubbed off. This coating has probably evolved because it provides some protection against ultra-violet light. Birds and small mammals love them, as do bears. They are not poisonous to humans, although eating them raw can produce nausea. They tend to be full of seeds, so if you are determined to eat some, the better plan is to take them home, cook them, strain out the seeds, and produce a jam, a pie, or – and this sounds interesting – wine. The entire shrub was popular in early Native American culture, where it was used medicinally, the wood was used for musical instruments, and the juice from the berries was used as dyes. On your John Muir Trail thru-hike it will be the color that jumps out at you. Except for the sky, blue isn’t a color you see much of on the trail. I always find it visually refreshing when I discover them growing alongside the trail.